In recent posts, we have talked about true classics in a variety of gentlemanly fields and we believe it is the perfect timing to add to the list the classiest of all classics – that even bears the attribute in its name: classical music. For centuries, classical music (or in colloquial terms “the symphony”) has been a favorite pastime of worldly gentlemen of all ages. So, if you think about your next outing with the dame of your choice, think about buying two tickets to the symphony. Chances are, with a little planning, you won’t regret it. Most of the time we speak of the symphony, we mean the actual location and not the musical arrangement. In the English language, this can be partly ascribed to the custom of using the term “symphony hall” for locations, suited for large orchestra performance. Over time, this has been abbreviated to symphony and today, people are simply going to the symphony. Technically speaking, however, people go to the symphony hall (e.g. “Wiener Musikverein,” the Musikverein in Vienna) to listen to the symphony orchestra (e.g. the Los Angeles Philharmonic Orchestra) playing a symphony (e.g. Wolfgang Amadeus Mozart’s Symphony No 38, also called “Prague Symphony” KV 504). Symphonies, however, are only a tiny part of the repertoire of a symphony orchestra. Usually, a symphony comes along in a number of so-called movements, which each can be distinct in attributes like key, themes, and tempo (speed). 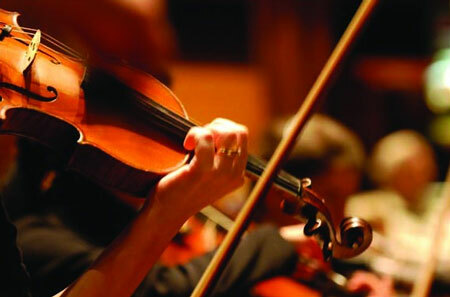 With three to five movements, symphonies easily take up more than 30 minutes. As a matter of fact, they can last a lot longer; the 3rd symphony by Gustav Mahler (1860 – 1911), considered the longest symphony of them all, extends to almost two full hours. That is why symphonies are usually only a part of an evening at the concert hall. While it may take up half or most of the evening, most symphonies are just a little too short to fill up the evening. Orchestras will therefore complement a concert night with other, shorter pieces such as an overture from an opera or a so called concerto. Often times, symphony orchestras partner up with a variety of other stars from Broadway, Jazz, or even country or pop music to make classical music more appealing to a younger audience. While it is a great opportunity for orchestras to showcase their craft, it can also reduce these amazing artists to a background role. We would therefore encourage a visit to a traditional concert, focused on classical music. It will elevate the nature of the concert and offer a unique experience that cannot be matched by any other musical performance. – Pick an evening featuring an overture from an opera. Overtures used to be the sign for patrons to go into the concert hall and take their seats, long before announcements were made through PA systems. An overture usually works with the different parts of the opera and summarizes its most important themes. Therefore, overtures usually have great variety. – Check out the different movements the orchestra plans to play and check their number and their tempo. As a rule of thumb, first and last movements offer the jaw-dropping effects; most popular symphonies establish their theme in the first movements and of course, the last movements deliver the grand finales. And you can always see the speed of the movements: Presto, for example, is very fast. Allegro is still fast, while Andante (walking pace) and Largo are slower speeds. – Soloists are great, but don’t do a whole lot for the experience, if you are new to classical music. If you have a great soloist perform, it can be a very specific experience. Of course, it does not necessarily mean that the soloist will take over entirely, but for effect, the more actually is the merrier. But: don’t be misled: Tchaikovsky’s piano concerto no. 1 in B Flat minor is a marvelous piece of art and will offer the full symphony experience. Some gentlemen out there may ask themselves about the proper dress code for a visit at the symphony hall. That is indeed a good question that we think deserves some clarification. As a rule of thumb, an outing to the symphony deserves the proper attire, in our case cocktail attire. However, sometimes it is acceptable to digress from the rule: afternoon showing, for example, are generally less formal, just like open air concerts. A nice sport coat or summer jacket will perfectly do the job. However, it is a sign of appreciation and respect for the musicians and directors to put some thought in one’s appearance, both for ladies and for gentlemen. Shine your shoes, put on that nice black two-button suit and a tie and you are good to go! The only true way to figure out what you like in classical music, as most people probably know, is experience of both things you like and things you don’t like. On the other hand, it is surely a very gentlemanly way to spend a sophisticated evening in the company of the lovely dame of your choice – that’s no question whatsoever. And in the end, classical music is just like any other style of music: it is designed and composed to entertain – and it usually does a marvelous job! Enjoy!